So for the purpose of this article lets call them Solar Tunnels! Solar Tunnels are a great way of reducing the darkness in a room with no windows. They capture the rays of light on your roof, transport it through a highly reflective tube into a dull, windowless room below. 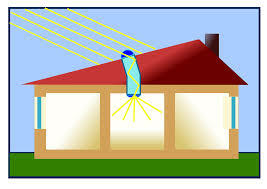 They can also be a great energy saver, removing the need to lights to be switched on during the day. I use this product a lot in my designs and to date, I can&apos;t recall any client thinking it was ever a bad investment! The product choice would very much depend on the requirement and location it is being designed for. There are currently various designs both internally and externally to choose from and this very much depends on the manufacturer of choice, the most popular brands are Velux or Fakro. How much light will you get from your sun tunnel? This answer varies with position and length of the solar tube but the short answer is a lot more than you do with a lightbulb. A south facing position on your roof is the best position, though ambient light will also make a difference if you can&apos;t install it there. The shorter the tube, the less “bounces” off the highly reflective lining the light has to make before it hits your room below. Solar tunnels for pitched roofs are designed to provide natural light into corridors, stairwells, bathrooms and cupboards, under pitched roofs, where installation of a roof window is not possible. The flexible tube tunnels and rigid tunnels provide installation flexibility. Flex tunnels can be used when the distance between the roof and the ceiling is too small or too great for a straight – or rigid – tunnel. Rigid tunnels deliver a straight shaft of light for when the ceiling is placed directly under the exterior window. A solar tunnel can be installed in tiled roofs or slated roofs. Sun tunnels for pitched roofs can be installed in roofs with 15°-60° pitches, specific products are available for flat roofs with a roof pitch between 0°-15°. Product information is available from various sources such as: internet, builders merchants, roofers, building designers.